It is likely the airports - Chennai, Kolkata, Kochi, Pune, Ahmedabad, Jaipur, Lucknow and Guwahati - will be bid out for 30 years and the tariffs will be fixed upfront. The government’s attempt at privatising maintenance of airport terminals has drawn a blank from investors. And, has forced the Narendra Modi government to mull complete privatisation - a plan initiated by the previous United Progressive Alliance government but dropped by the current regime, facing protest from employee unions. The plan is to privatise at least eight government-owned airports - Chennai, Kolkata, Kochi, Pune, Ahmedabad, Jaipur, Lucknow and Guwahati. 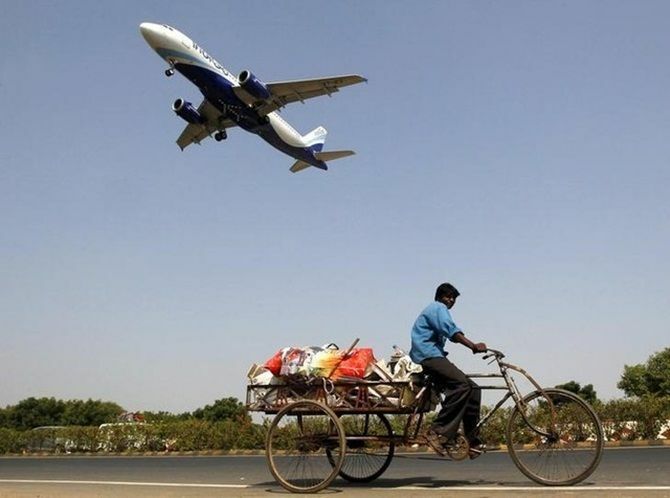 The civil aviation ministry is having discussions on designing the model on how the airports would be bid out, according to sources. It is likely the airports will be bid out for 30 years and the tariffs will be fixed upfront. Under the two models being examined, one is a forward bidding process based on tariff per passenger. Under this, players will bid on fee per passenger it will share with the Airports Authority of India (AAI). The player that quotes the highest figure will be chosen. The landing and user charges an operator will set during the concession period will be fixed upfront by the ministry. The other model being considered is a reverse bidding model - essentially a tariff-based bidding. Under this, a bidder who quotes the lowest landing and user charges will emerge winner. In this case, the revenue to be shared with the AAI will be fixed upfront. AAI chairman Guruprasad Mohapatra said the government was looking at different options but refused to give details. Officials said the model of bidding will be distinctly different from the process followed for Delhi and Mumbai airports. “Our experience with privatisation has shown tariffs in cost-plus projects are based on investments made by the operator. User charges consequently shoot up. We are now looking at a model where airports can be privatised on the basis of fixed tariff,” a government official said. In the case of privatisation of Delhi and Mumbai airports, a bidder was selected on the basis of the highest share of revenue offered to AAI from the gross revenues of the airport. This reduced the scope of return on investment for the developer, leading to an increase in tariff for compensation. Over the past decade, GMR and GVK, the operators of the two airports, have run up costs in excess of estimates because a clear process was not established for determining the appropriate level of capital expenditure. For instance, the cost of modernising Delhi and Mumbai airports more than doubled to $3 billion each. “We welcome the government’s move. Fixing the tariff upfront will bring regulatory clearance and encourage foreign airport developers to invest in Indian airports,” said Satyan Nair, secretary general, Association of Private Airport Operators. The Centre has been forced to look at the model of privatisation after the bidding process for operation and maintenance (O&M) of airport terminals at Ahmedabad and Jaipur ended in a stalemate, with the GVK group being the only company that submitted a formal bid. Officials of the AAI, which conducted the bidding process, said private players cited unviability of the projects as a reason for staying away. Under the O&M model, only certain activities like maintenance of terminal and car parking at Jaipur and Ahmedabad airports were to be handed over to private developers. “Private players say there is lack of opportunity to get healthy returns on investment by managing only airport terminals. "They have suggested that airside and city-side development should also be made part of the process,” an AAI official said. Which desi airport is 1 of the most followed on SM? What can Payments banks do for You?